Preheat the oven to 350°. To prepare the biscuits, combine all dry ingredients in a medium mixing bowl. Combine all wet ingredients in a measuring cup, except the safflower oil, whisk and let rest for 5 minutes until curdled. Place the liquid ingredients in a blender and pulse several seconds. Combine the wet and dry ingredients and form into a ball of dough. Lightly flour flat surface and roll out the ball of dough until about 1/2 inch thick. Using a cookie cutter or a glass cut the dough into round biscuits about 3 inches wide. Lightly oil a cookie sheet with safflower oil, place the biscuits on and bake for about 15 to 20 minutes, until slightly golden. Do not over bake. While the biscuits are baking, slice 4 cups of strawberries and place in a small mixing bowl. Place the remaining 5 cups strawberries in the blender with the maple syrup and pulse several seconds. Pour the strawberry liquid over the sliced strawberries and refrigerate while you make the tofu whipped cream. Place the tofu, oil, maple syrup, honey, vanilla, lemon juice and salt in a blender and purée until smooth. Place the water and agar flakes in a small saucepan and bring to a boil. Reduce the heat to medium low and simmer about 5 minutes or so until the flakes dissolve. Pour the agar liquid into the blender with the tofu mixture. Blend for 2 to 3 minutes. Pour into a dish and place in the freezer for about 5 minutes to gel. Remove, place in the blender again and pulse until smooth and creamy, but stiff like whipped cream. 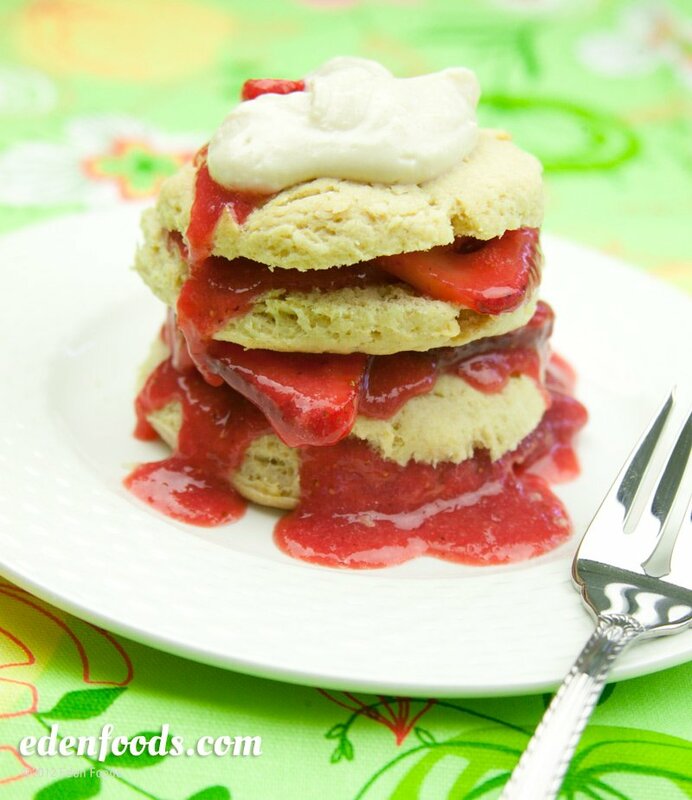 When the biscuits are done, slice in half or leave whole, ladle strawberry sauce over and add a dollop of tofu whipped cream before serving.